Line from the very famous song ‘Dil dhoondta hai fir wahi fursat le raat din’, sung by extremely talented Mr. Bhupinder Kumar and written by the legendery Gulzaar Saab from the film (Hindi)Mausam. 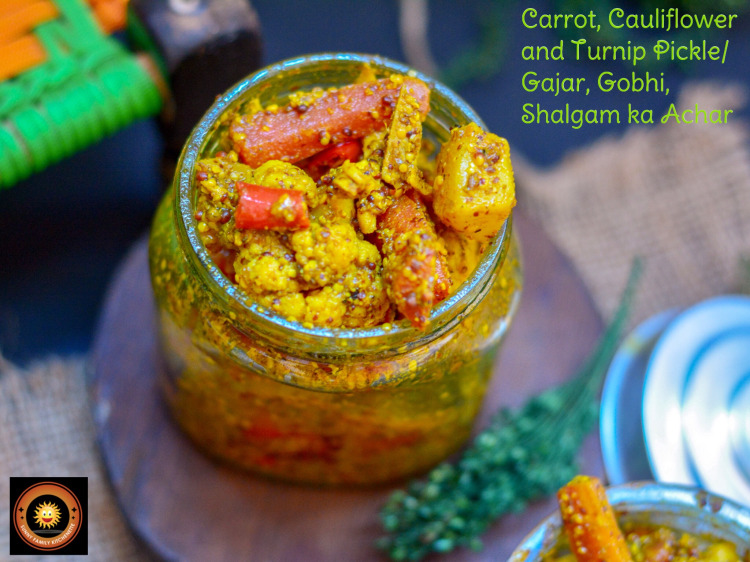 While making this pickle I was humming this song throughout, and it took me to those golden old days when my Mom and Aunts used to make this pickle while lazing and chatting in wintery sunshine. Their work used to get over so fast amid their talking and gossiping sessions. I was cleaning and chopping veggies and remembering all the fun we used to have. 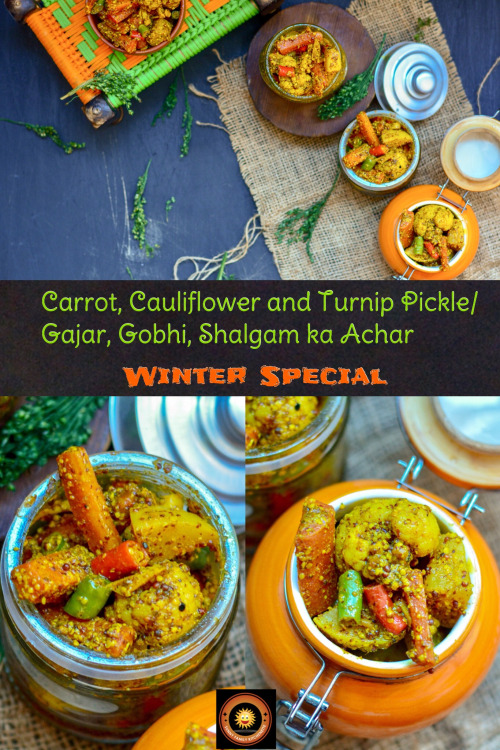 This recipe is very seasonal, very wintery, very traditional!! This post is a pure nostalgic winter share. 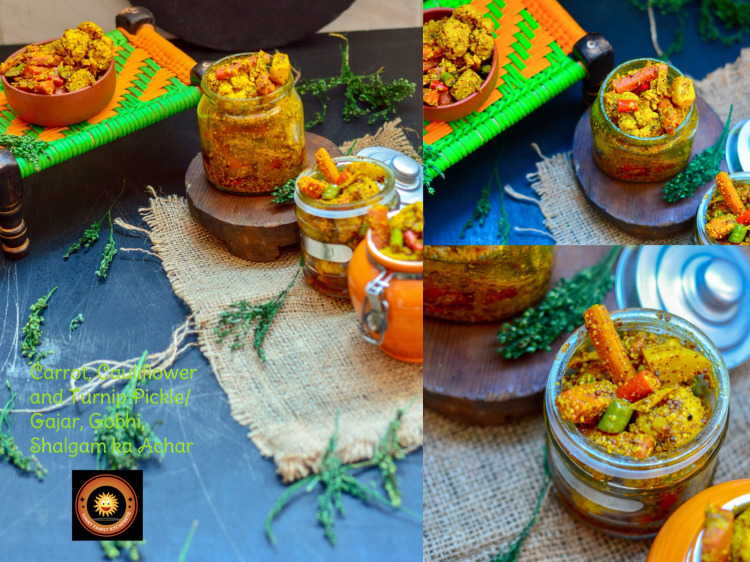 It took me to my childhood days, when eating this pickle used to be every winter’s ritual. Whatever is on the menu, this pickle always used to find its way to the plate. 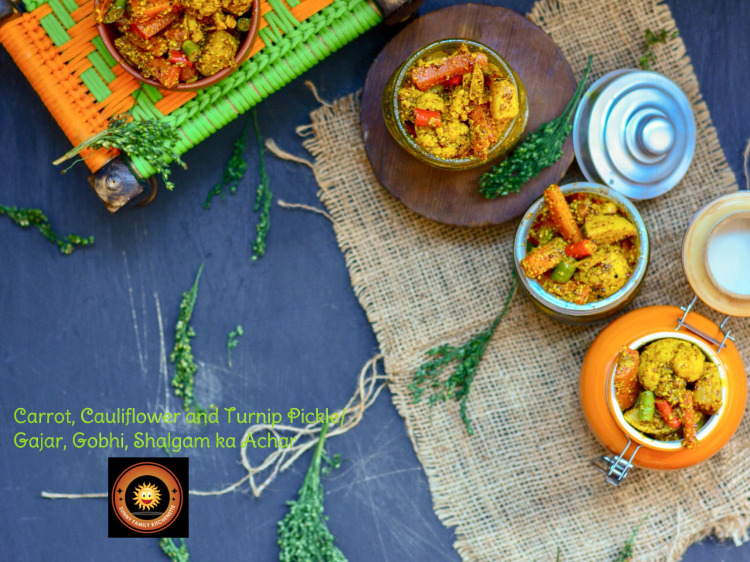 I still remember how we siblings used to relish it with pulao and stuffed paranthas. Eating pulao with this pickle while lazing in the sun is pure bliss!! Ahhh!! Miss those good old days when life used to be so simple and so pure. 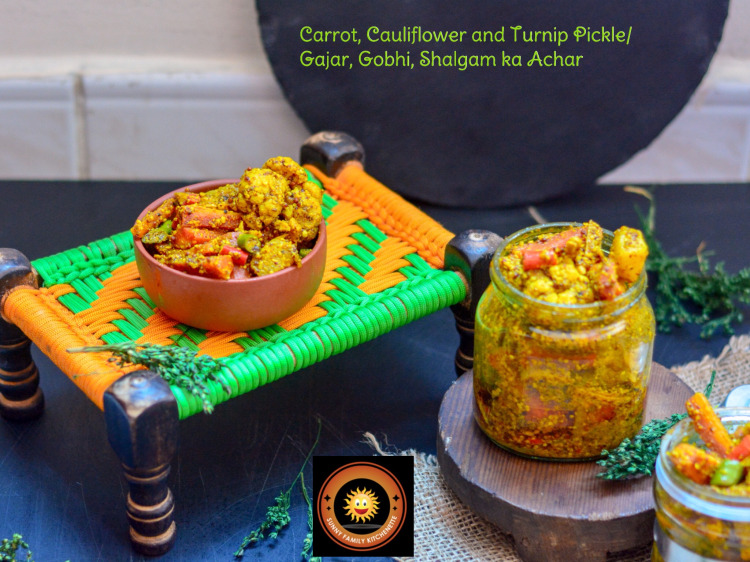 This is such a versatile dish.This pickle goes with anything and everything, be it Chapati, parantha, poori, bread, pulao or even plain rice. And trust me it’s tooo tooo addictive. I always used to find a reason to eat this delicious pickle. Sterilized containers to store prepared pickle. There are steps to prepare this pickle. I will write the all the directions which we have to follow step wise. For that take all the veggies and cut cauliflower into small florets. Rinse them thoroughly. Peel and cut carrots lengthwise into about 2-3 “pieces. Rinse the pieces. Similarly peel and cut turnip into small pieces. Rinse thoroughly. 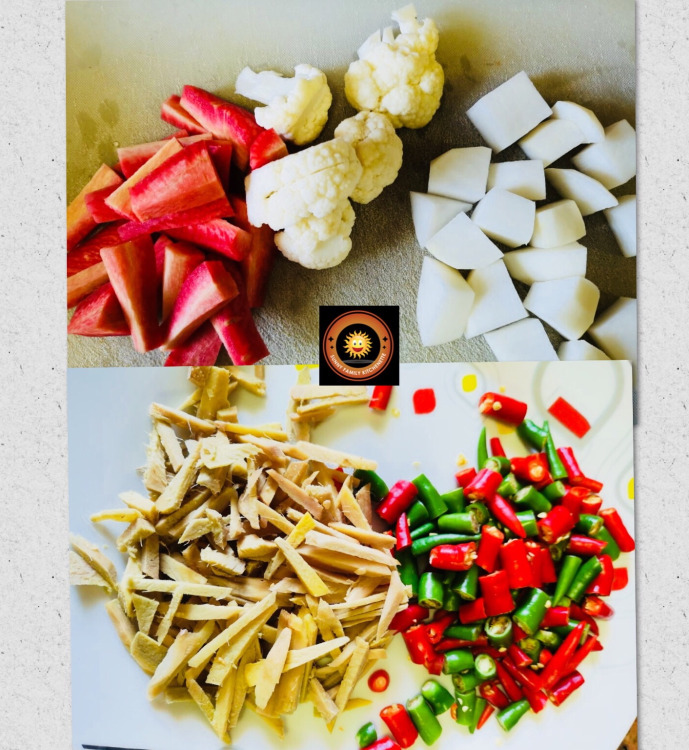 Cut the green chilies into bite sized piece and ginger in desired size. 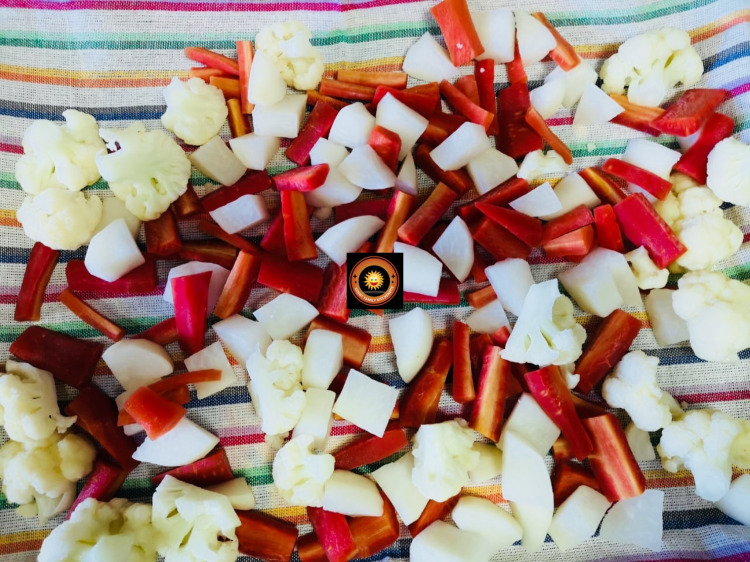 There’s no hard and fast rule to cut veggies in particular shape or size. You can cut them according to your choice. Keep water in a bag pan for boiling. The water should be enough to dip all the veggies. Put all the cut veggies (except chilies and ginger) in boiling water. Boil for exactly 3 minutes. Turn off flame. Take out the veggies immediately from the boiling water into a strainer, drain water. Keep the veggies in strainer for 5 minutes. Let the water drain out completely. 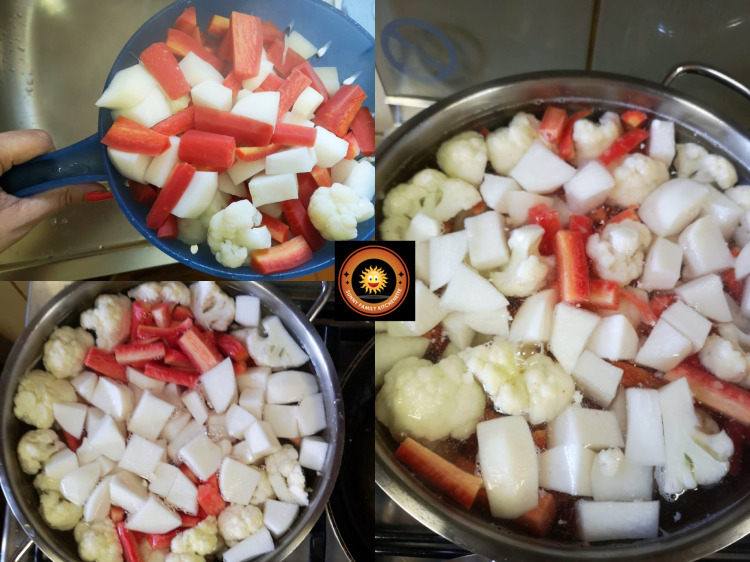 Spread the blanched veggies over a cloth and dry it in sunlight or under fan. It will take 1-2 hours to completely dry them. There should be no moisture in the veggies as it will spoil the pickle. 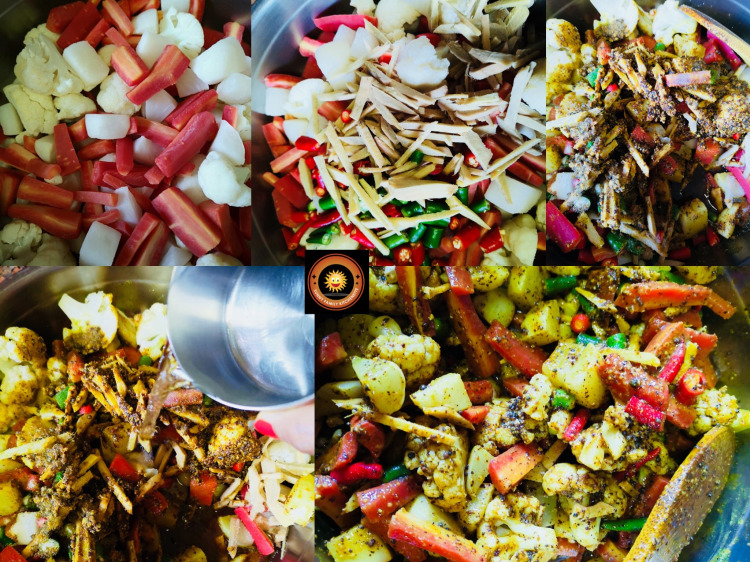 Meanwhile let’s prepare the Masala for pickling the veggies. In a pan put cumin seeds, black pepper and fenugreek seeds. Stir and roast slightly for 1-2 minutes. Take it out in a plate to cool off. Once the roasted spices are cooled put the whole spices in a jar and coarsely grind them. Coarsely grind mustard seeds also. In the same pan put mustard oil. Let the oil heat up till smoky hot. Once oil is hot. Turn off the flame and let it cool. Once oil is cooled off, switch on the heat again. 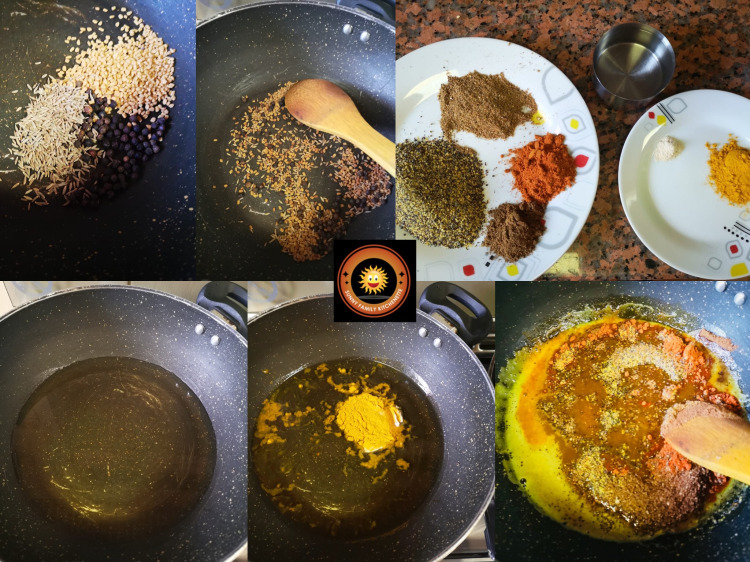 When oil becomes hot add asafoetida, turmeric powder, coarsely ground spices, grounded mustard seeds, chili powder, salt and garam masala powder too. Put the dried veggies in a big bowl. Add green chilies , ginger and salt. Add in the oil and spices well with the veggies. 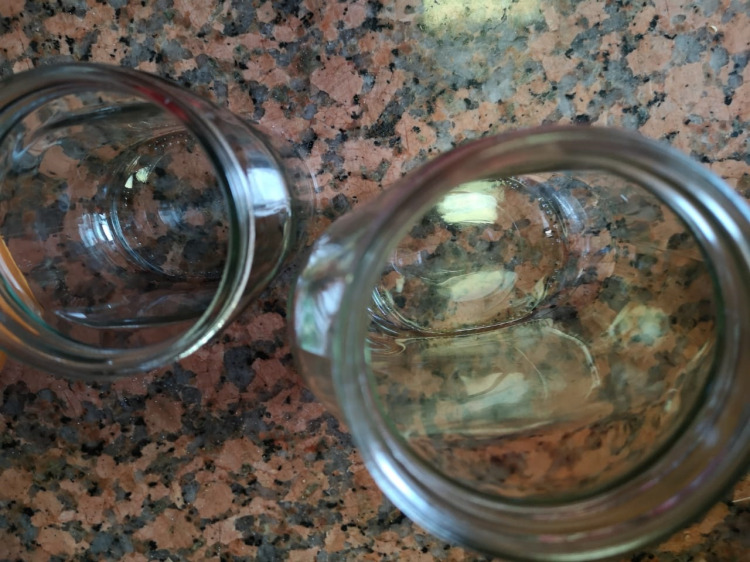 Sterilized glass containers to store the pickle. Pickle is ready. But it will mature and taste better after 3 days. 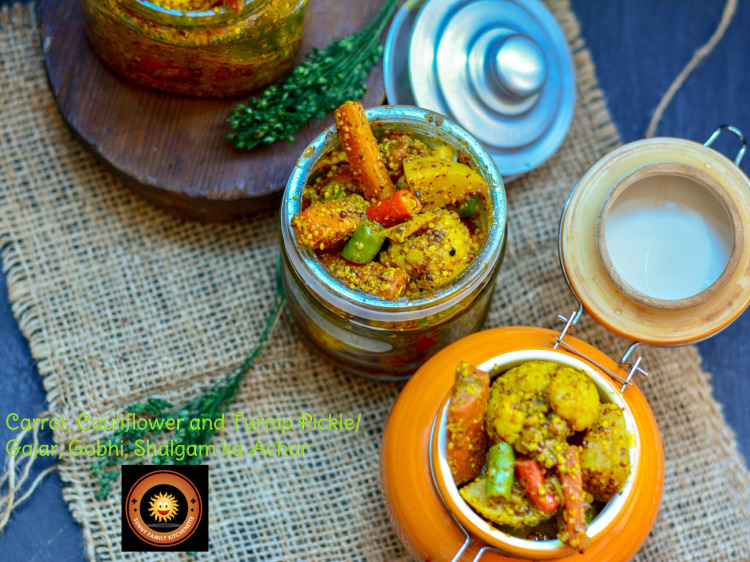 Keep the pickle in a food grade clean plastic container or any sterilized glass container and you can relish it for 3 to 4 months. 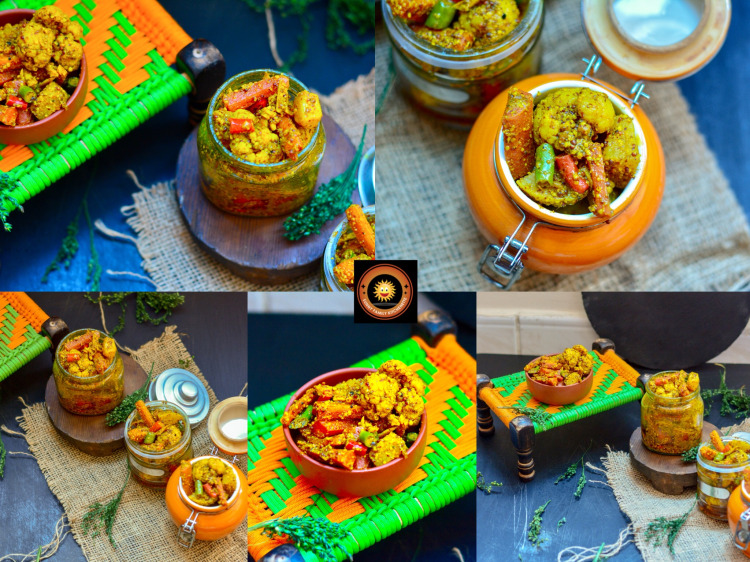 Enjoy this delicious pickle with poori, parantha, stuff parantha, chapati, rice or on its own.